Previous work has shown that patients with chronic obstructive pulmonary disease (COPD) demonstrate changes in their gait biomechanics as compared to controls. This pilot study was designed to explore the possibility that biomechanical alterations present in COPD patients might be amenable to treatment by exercise training of skeletal muscle. This study investigated the effect of a 6-week exercise intervention on gait biomechanics in patients with COPD under both a rest and a non-rested condition. Seven patients with COPD underwent a supervised cardio-respiratory and strength training protocol 2-3 times per week for 6-weeks for a total of 16-sessions. Spatiotemporal, kinematic and kinetic gait variables were collected prior to and post intervention. All patients demonstrated significant improvements in strength following the intervention. The knee joint biomechanics demonstrated a significant main effect for intervention and for condition. Step width demonstrated a significant interaction as it decreased from pre- to post-intervention under the rest condition and increased under the non-rested condition. It does appear that being pushed (non-rested) has a strong influence at the knee joint. The quadriceps muscles, the primary knee extensors, have been shown to demonstrate muscular abnormalities in patients with COPD and the intervention may have influenced gait patterns through an effect on this skeletal muscle structure and function. Additionally, the intervention influenced step width closer to a more healthy value. Patients with COPD are more likely to fall and step width is a risk factor for falling suggesting the intervention may address fall risk. Whether a longer duration intervention would have more profound effects remains to be tested. Funding support: Funding provided by the American Society of Biomechanics Grant-in-Aid, American Alliance for Health, Physical Education, Recreation and Dance Graduate Student Grant-in-Aid, NASA Nebraska Space Grant Fellowship program and Research Support Fund from the Nebraska Medical Center and the University of Nebraska Medical Center. Date of acceptance: March 21, 2014. Abbreviations: National Health and Nutrition Examination Study, NHANES; Veterans Affairs, VA; forced expiratory volume in 1 second to forced vital capacity ratio, FEV1/FEV; hertz, Hz; analysis of variance, ANOVA; 1-repetition maximum test, 1-RM. COPD is a major public health problem28and numerous interventions have been explored. Pulmonary rehabilitation dramatically improves patient well-being with beneficial effects on strength, exercise tolerance (not physical activity per se), dyspnea and self-efficacy. 29,31 Unfortunately, increases in physical activity are less reliably observed. 32-41 Pulmonary rehabilitation programs mainly utilize a focus on education, nutrition and exercise42 and are not necessarily focused on improving functional limitations. A program that focused on high-intensity cardio-respiratory and strength training may demonstrate a stronger impact on functional limitations, specifically gait. Hence, gait alterations are present in patients with COPD, in addition to these patients being at a greater risk for falls. Skeletal muscle weakness and muscular fatigue, as well as, disuse could all be contributors. Pulmonary rehabilitation substantially improves exercise performance and these benefits are likely due to exercise training of skeletal muscle. Therefore, the purpose of this exploratory study was to assess the feasibility of assessing gait biomechanics in patients with COPD and to determine if observed trends in improvements following intervention could be found. To do this, patients with COPD underwent an intense 6-week exercise intervention and their gait was evaluated before and after the intervention. Based upon studies that have demonstrated improvements in skeletal muscle outcomes after pulmonary rehabilitation in patients with COPD, it was hypothesized that gait would be altered due to the intervention’s effects on the skeletal muscle structure and function. Since the majority of changes in the gait patterns of patients with COPD were documented in a non-rested condition, 8 the second aim of this study was to examine patients’ gait biomechanics under both rested and non-rested conditions. It was hypothesized that patients would demonstrate the alterations in their gait performance during the non-rested condition and that these would be responsive to intervention. Patients with COPD were recruited from the Pulmonary Studies Unit at the University of Nebraska Medical Center and the general clinics from the Department of Veterans’ Affairs (VA) Nebraska Western Iowa Healthcare Center. COPD was determined based on spirometry testing. A ratio of forced expiratory volume in 1 second to forced vital capacity (FEV1/FVC) of 0.7 was used to define the presence of COPD. Spirometry testing was completed without a bronchodilator. Participants were excluded if they presented with the history of back or lower extremity injury or surgery that affected the subject’s mobility or any other process limiting the ability to walk, including neurological disease or other impairment. Additionally, all participants were able to understand task instructions and physically perform the experimental tasks such as walking on a treadmill independently. Screening for inclusion was completed by a nurse practitioner who completed a comprehensive medical history and physical. In addition, all participants underwent a modified Balke cardio-respiratory stress test to determine their ability to safely participate in an exercise intervention. All cardio-respiratory stress tests were read by a pulmonary physician and specific recommendations related to exercise were incorporated into their intervention (i.e., oxygen use during exercise) when necessary. In total, 9 patients with COPD were consented and participated in this study. 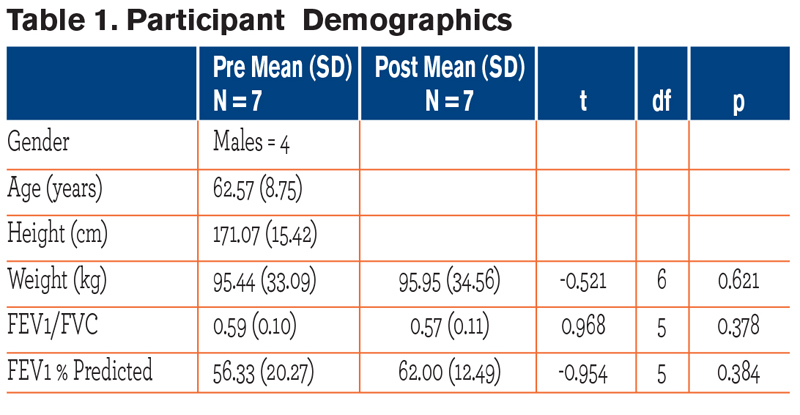 Two dropped out before completing the exercise intervention and thus, 7 completed the entire study (Table 1). The University’s institutional review board and the institutional review board at the Omaha VA Medical Center approved all procedures. All participants underwent gait analysis testing before and after an exercise intervention. Retro-reflective markers were placed on anatomical locations, bilaterally, according to a modified Helen Hayes marker set. 43 Participants were asked to walk through a 10-meter walkway at a normal pace. To ensure that a complete footfall would be collected during each trial, starting positions for each limb were determined prior to data collection. Five trials were collected for each limb, 10 trials total. The 3D marker trajectories were collected with a high-speed motion capture system (Motion Analysis Corp., Santa Rosa, CA) sampling at 60 hertz (Hz). Ground reaction force data from heel contact to toe off were collected using a piezoelectric force plate (Kistler Instrument Corp., Winterthur, Switzerland) sampling at 600 Hz. All participants were given a 1-minute rest between each trial during the data collection (rest condition). All patients with COPD were then asked to determine their self-selected pace on the treadmill at 0% incline. Once a speed was selected, the speed was increased slightly to confirm that the speed chosen was in fact a comfortable pace. The treadmill accommodation period was given for 5 minutes. Participants were asked to rest and once well rested, returned to the treadmill. They walked at their chosen self-selected pace at 10% incline until the onset of self-reported tiredness (reported as either the development of shortness of breath or the onset of subjective muscular fatigue). Once the participant reported the presence of tiredness, they were immediately removed from the treadmill and asked to walk through the 10-meter walkway, 5 times for each limb, with no rest in between trials (non-rested condition). Gait kinematics and kinetics were calculated from the sagittal plane of motion during the stance phase of walking for each individual. Each marker’s 3 directions were filtered using the Jackson algorithm. 44 Cutoff values ranged from 2 to 8 Hz. Visual 3D (C-Motion, Inc., Germantown, Maryland) was used for calculation of joint angles, joint moments and joint powers. A standing calibration was used to obtain a rotation matrix for each limb segment to align the local (anatomical) reference frames of the thigh, shank, and foot to the global (laboratory) reference frame. A hybrid model was built using anthropometric data from Dempster. 45 Custom MatLab programs (MatLab 2007, Mathworks, Inc., Concord, MA) were used to pick peak angles, moments and powers from calculated joint curves (Table 2). 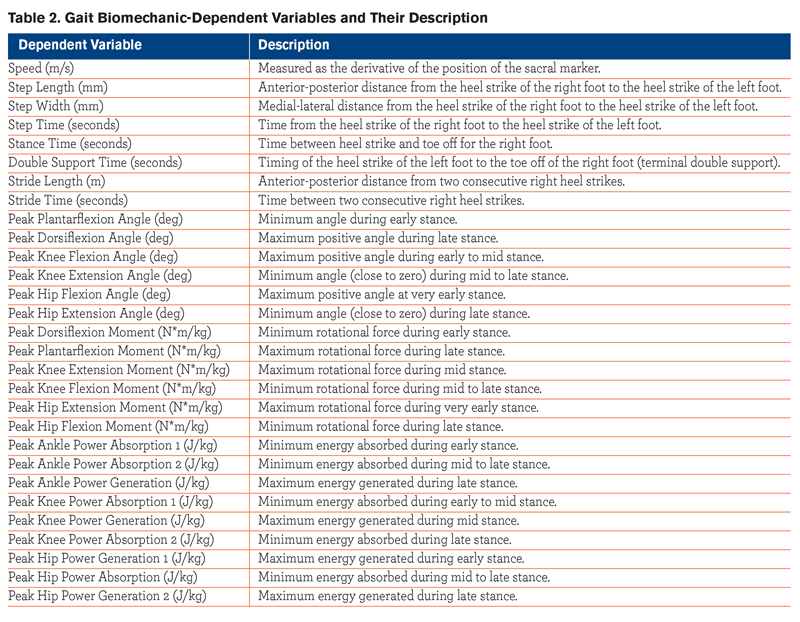 In addition, spatiotemporal gait parameters were calculated from custom MatLab programs (Table 2). Gait data collections were done prior to the exercise intervention (pre) and within 7 days of completion (post). The 6-week exercise intervention consisted of both cardio-respiratory and strength training. Each participant reported to the University of Nebraska at Omaha Health, Physical Education and Recreation building 2 to 3 times per week for a 1-hour session each time. The total number of sessions was 16. Each participant was assigned a graduate student who worked with him/her during each session and throughout the entire course of the program. During the very first and very last session, the following variables were collected: resting heart rate, height, weight and circumference measurements of the participant’s chest, waist, upper arm, hips, thigh and calf. In addition, the participants performed a 1-repetition maximum (1-RM) test 46 to determine changes in strength for the following major muscle groups: back, chest, shoulders, hamstrings and quadriceps. These tests were performed for back row, chest press, shoulder press, leg extension and leg flexion. Each continuing session consisted of 30 minutes of training on the cycle ergometer with intensity set at a rate of 70% of their heart rate maximum [((220-age-resting heart rate) x 0.70) + (resting heart rate)]. 46 The majority of the participants could not perform 30-minutes of cardio-respiratory exercise continuously at the beginning of the program. They were allowed to stop and start again until a total of 30 minutes was completed. However, by the end of the exercise intervention sessions, each participant was able to complete the 30-minutes of training on the cycle ergometer at a minimum of 70% of his or her maximum heart rate without rest. Heart rate was monitored during all exercise activities using a Polar® heart rate chest monitor. All participants underwent a cardio-respiratory stress test prior to starting the exercise intervention. Only 2 participants were required to use oxygen during their exercise routines. No other recommendations or restrictions were given. No significant differences were found for changes in resting heart rate, weight or circumference measurements from pre- to post- intervention. On the contrary, all 1-RM measures significantly improved with training (back row: p=0.002; chest press: p<0.001; shoulder press: p=0.03; leg flexion: p=0.007; leg extension: p=0.019). 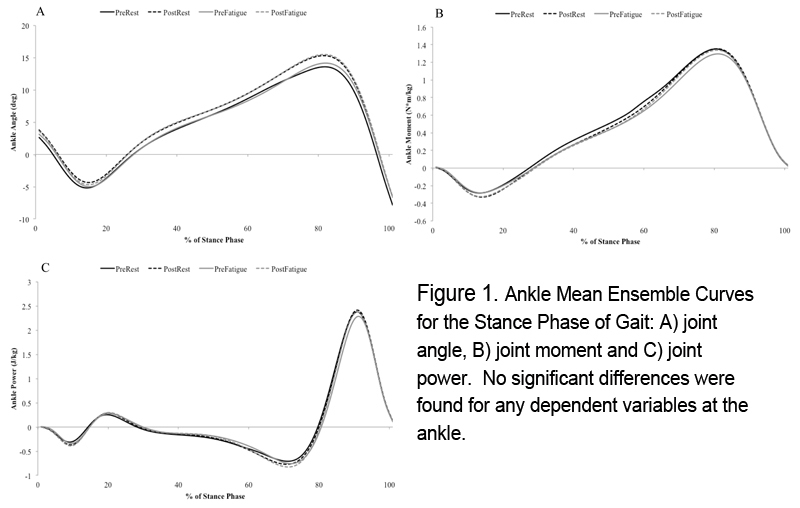 Mean ensemble curves for the ankle, knee and hip joint angles, moments and powers at both pre and post intervention and under both rest and non-rested conditions are shown in Figures 1 to 2. There was no main effect found for the exercise intervention (pre vs. post) for any of the spatiotemporal or kinematic variables. Only one kinetic variable, peak knee power absorption during early stance, was significantly increased (absolute value) from pre to post testing (p=0.02). Significant main effects for condition (rest vs. non-rested) were found for several variables. Speed significantly increased from rest to non-rested (p=0.004) as well as significant increases in step and stride length (p=0.01 and 0.02, respectively) were found (Table 4). For kinematic variables, peak knee flexion and peak hip flexion angles increased from rest to non-rested (p=0.002 and 0.04, respectively) (Table 5). 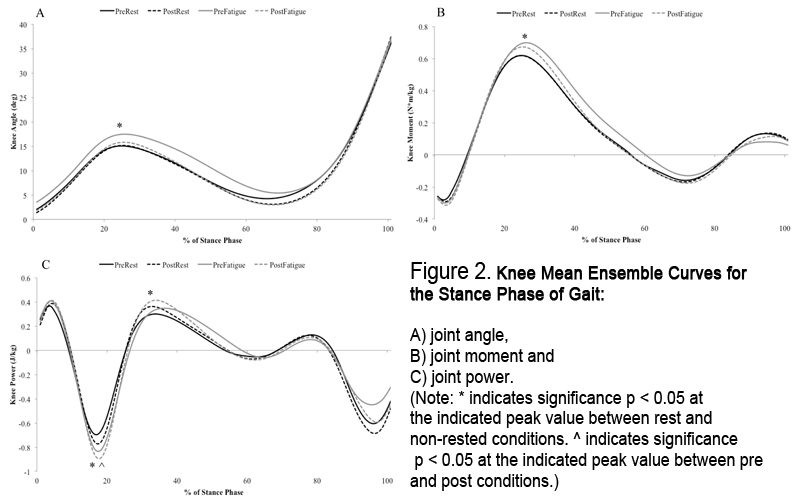 The knee was the only joint where significant increases in kinetic variables were found; with peak knee extension moment demonstrating a significant increase from rest to non-rested (p=0.006) (Table 6). In addition, peak knee power absorption during early stance and peak knee power generation during mid-stance demonstrated significantly greater values during non-rested walking (p=0.02 and 0.01, respectively) (Figure 3). Step width demonstrated a statistically significant interaction (p=0.02; Figure 4). Step width decreased from pre- (125.0+41.2mm) to post-intervention (119.0+48.3mm) under the rest condition. Under the non-rested condition, mean step width increased from pre- to post-intervention (109.2+40.3mm and 117.2+45.4mm). The purpose of this study was to explore the effect of a relatively short-duration, yet intense, exercise intervention on the gait biomechanics in patients with COPD. It was hypothesized that the high intensity of the intervention would lead to changes in the gait patterns of patients with COPD. The current findings did not fully support our hypotheses. Out of the 29 dependent variables examined, only 1 variable, peak knee power absorption during early stance, demonstrated a main effect of intervention. It was also hypothesized that patients would demonstrate a change in performance during the non-rested condition and this hypothesis was supported by the findings, especially at the knee joint. The knee joint biomechanics demonstrated both a main effect of intervention and of condition. Further, a statistical interaction was found for step width. 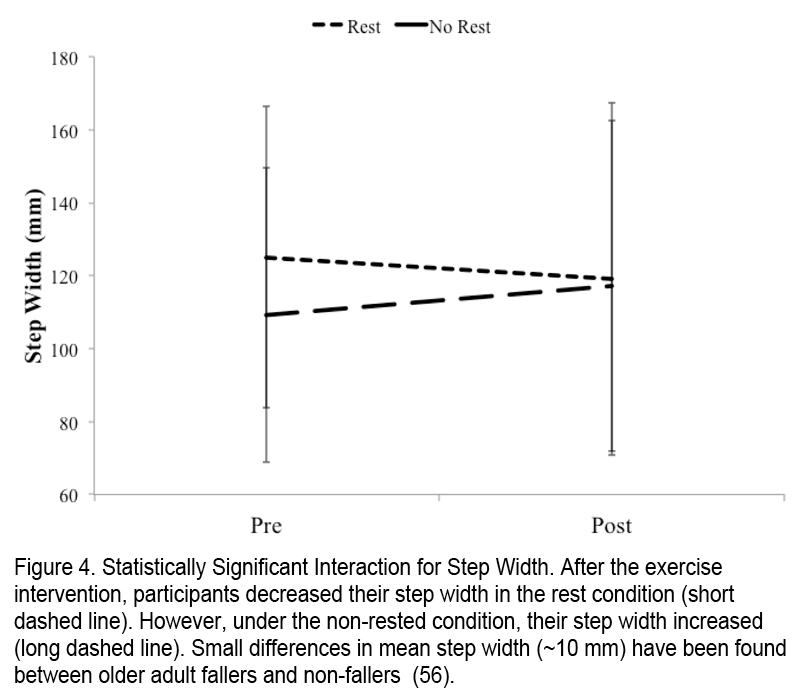 Step width values demonstrated a decrease from pre- to post-intervention in the rest condition and an increase from pre- to post-intervention in the non-rested condition (Figure 4). As compared to their healthy counterparts, patients with COPD demonstrate abnormalities in gait such as an observed limp or shuffle and these abnormalities are associated with disease severity. 7 In Yentes, et al, biomechanical analyses were conducted to compare patients with COPD to healthy older controls in both the rested and non-rested conditions. 8 Patients with COPD demonstrated alterations in gait in the non-rested condition. These documented changes are an increase of function at the hip joint in order to compensate for the loss of function at the ankle joint. This type of profile has been suggested to be a neuromuscular adaptation to aging, 9, 49 disease 50 and task. 51 The neuromuscular system redistributes the kinetics of the lower extremity to compensate for a change of function at one joint due to fatigue, skeletal muscle abnormalities, pain, etc. The knee joint biomechanics demonstrated changes both for intervention (pre vs. post) and for condition (rest vs. non-rested). The knee absorbed more energy (power) during early to mid-stance due to the intervention (p=0.02). Upon comparing the mean ensemble curves to norms, the hip appears to be generating more energy during this same period of stance; thus, demonstrating a redistribution of joint power to compensate for changes in function at the hip. A condition effect was demonstrated kinetically and kinematically at the knee as well. Peak knee flexion angle (p=0.002), knee extension moment (p=0.006), knee power absorption at early to mid-stance (p=0.02) and knee power generation (p=0.01) increased in the non-rested condition as compared to rest. This indicates that the knee is compensating for alterations in function at both the ankle and the hip. The hip reached a greater peak flexion angle during the non-rested condition as well. 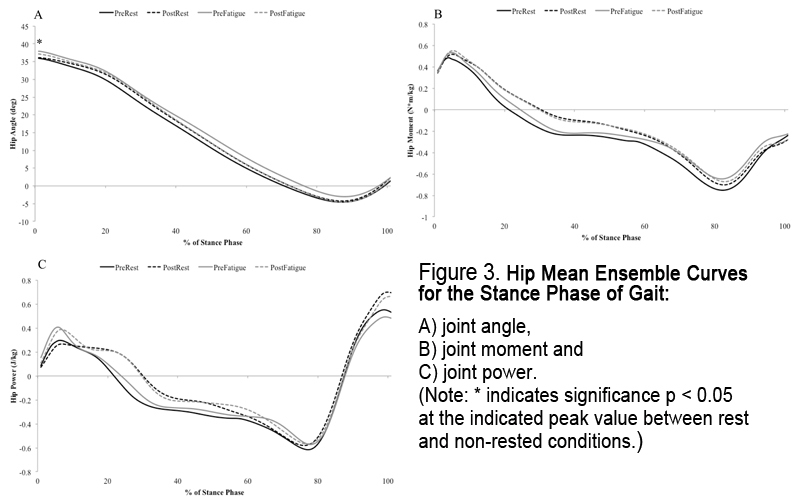 Kinetically, during early stance, the hip increased peak extension moment (p=0.11) and this is followed shortly after by an increase in the knee extension moment at early mid stance (p=0.006). These changes could be in preparation for a decrease in peak plantar flexion moment at late stance (p=0.08). During the non-rested condition, the increases in power absorption at early stance at the knee (p=0.02) could be in response to the increase in power generation at the hip during very early stance (p=0.07). It appears that this increased energy absorption by the knee during early stance (p=0.02) then leads to the knee having to replace that energy by increasing the peak power generation during mid-stance (p=0.01). Two plausible explanations as to why the knee is more susceptible to changes are: 1) the increase in speed demonstrated during the non-rested condition and/or 2) the presence of muscular abnormalities reported in the quadriceps muscles. First, it is feasible that due to the increase in walking speed during the non-rested condition, the knee compensated for the increased speed by generating larger knee extension moments, absorbing greater amounts of energy in early stance followed by an increased generation of energy in mid-stance. However, if speed was the main factor, one would expect to see increases in the plantar flexor muscles as well, as they are the main generator of energy at push-off, which was not seen in this study. If the neuromuscular strategy were completely intact, it would be anticipated that increases would be noted across all joints. Rather, significant changes were only seen at the knee. More plausibly, the changes at the knee are due to the muscular abnormalities reported in the quadriceps. These abnormalities may lead to an altered ascending drive (peripheral input) and therefore, modifications in the neuromuscular strategy (descending drive) leading to changes seen at the knee, whether helpful or harmful to the overall strategy. Skeletal muscle changes noted in the quadriceps include decreased mitochondrial density and fractional area in the vastus lateralis52 with decreased oxidative enzymes leading to decreased oxidative capacity 19 and oxidative damage, possibly leading to atrophy and muscle wasting. 53 In contrast, it has been shown that the more distal tibialis anterior has normal fractional area and oxidative capacity despite decreased mitochondrial density. 52 In addition, muscle fiber type shifting has been demonstrated in the vastus lateralis, where oxidative fiber type (type-I) shifted to glycolytic fiber types (type-II). 13,15,54 Quadriceps musculature typically has 46-52% type-I fibers and the anterior tibialis has 73% type-I fibers. Therefore, a shift away from type-I fibers as well as oxidative changes in the quadriceps could lead to changes in knee joint function during gait. Interestingly, the only statistically significant interaction reported for the current investigation was in the spatiotemporal parameter, step width. Changes in step width have been found to be associated with fall risk55-57 and fall risk is increased in patients with COPD. 58-60 Even the smallest decrease in mean step width (~1 cm) has been documented in older adults that fall as compared to those that do not. 56 Older adults tend to demonstrate a step width of roughly 21 cm. 56,57 Under the rest condition, patients with COPD walked with a much narrower step width (12.5 cm) at baseline, as compared to these reported normal values. Their step width became even narrower post intervention, dropping to 11.9 cm. It is feasible that this is indicative of fall risk, however further work will need to be done to fully understand the effect of an intervention on step width as well as the association of step width and fall risk in patients with COPD. Conversely, step width increased from pre- to post-intervention in the non-rested condition (10.9 cm to 11.7 cm) demonstrating that step width improved toward normal values comparable to their healthy counterparts. It is not likely that the intervention utilized changed the step width of the patients directly. Rather, it is more likely that an indirect mechanism is at play. Although not collected for the current study, it is possible that the intervention provided the patients confidence in terms of their ability to complete demanding tasks without falling. A fear of falling has been related to step width in other populations 61-63 and it is possible that the intervention elicited a change in fear of falling. Further studies regarding step width in patients with COPD should investigate the relationship between step width, fall incidence and fear of falling. Further, specific interventions could be designed to target step width directly and/or indirectly. There are several limitations in the current study. First, it is possible that the increases in strength reported in this study are due to neuromuscular improvements rather than solely muscular strength gains. The improvement in muscular strength following exercise intervention is well documented in patients with COPD. These studies varied in duration from 6 to 12-week interventions, relatively similar to the current intervention. Interestingly, short-duration strength gains have been related to neural adaptation rather than hypertrophy of the muscle fibers themselves. 69-71 It is feasible that these studies are not a long enough duration to demonstrate muscle hypertrophy and structural changes to elicit the strength gains. Third, COPD is heterogeneous and individuals may have varied gait abnormalities. To date, one study has presented support for gait abnormalities in patients with COPD. 7 This study examined the association of walking abnormalities with disease severity in COPD using NHANES. Gait abnormalities reported in this dataset were based upon physician observation or patient self-report. Another study assessed a limited number of individuals with COPD and controls. 8 Although no differences were found in patients with COPD compared to healthy controls in terms of biomechanical gait patterns either in a rest or non-rested condition, the gait biomechanics in COPD patients did, however, change significantly from the rest to the non-rested condition in which the hip compensates for adaptations at the ankle. It seems likely that gait abnormalities may be a clinical feature that is characteristic of a subset of COPD patients. Studies much larger than those completed to date will be required to assess this possibility. In summary, the current study investigated the effect of a 6-week exercise intervention on gait biomechanics in patients with COPD under both a rest and a non-rested condition. Although only 1 difference at the knee was found for the intervention, interesting findings at the knee in rest vs. non-rested conditions and changes in step width were demonstrated. It does appear though that the lack of rest has a dramatic influence on the ability of COPD patients to walk, especially at the knee joint. This is consistent with the reported histological and biochemical alterations in quadricep muscles of individuals with COPD. Importantly, the current study demonstrated that training influenced step width in patients with COPD. COPD patients are more likely to fall and step width has been indicated as a risk factor for falling. This suggests that training may have an effect on fall risk in patients with COPD. The authors would like to thank Mrs. Mary Carlson, NP for her assistance in screening participants and Mr. Jeff Kaipust for assistance in data collection. Jennifer Yentes, Daniel Blanke and Nicholas Stergiou declare no conflict of interests. Stephen I. Rennard received fees for serving on advisory boards, consulting, or honoraria from Almirall, APT Pharma, Aradigm, Argenta, AstraZeneca, Boehringer Ingelheim, Chiesi, Dey, Forest, GlaxoSmithKline, Hoffmann-La Roche, MedImmune, Mpex, Novartis, Nycomed, Oriel, Otsuka, Pearl, Pfizer, Pharmaxis, Merck, and Talecris. 2. McGlone S, Venn A, Walters EH, Wood-Baker R. Physical activity, spirometry and quality-of-life in chronic obstructive pulmonary disease.COPD. 2006;3(2):83-8. doi: http://dx.doi.org/10.1080/15412550600651263. 3. Watz H, Waschki B, Boehme C, Claussen M, Meyer T, Magnussen H. Extrapulmonary effects of chronic obstructive pulmonary disease on physical activity: A cross-sectional study. Am J Respir Crit Care Med. 2008;177(7):743-51. doi:http://dx.doi.org/10.1164/rccm.200707-1011OC. 4.Garcia-Ayermich J, Felez MA, Excarrabill J, et al. Physical activity and its determinants in sever chronic obstructive pulmonary disease. Med Sci Sports Exerc. 2004. 36:1667-1673. 5. Tudor-Locke C, Craig CL, Aoyagi Y, et al. How many steps/day are enough? for older adults and special populations.Int J Behav Nutr Phys Act. 2011;8:80. doi:10.1186/1479-5868-8-80.doi: http://dx.doi.org/10.1186/1479-5868-8-80. 6. Tudor-Locke C, Washington TL, Hart TL. Expected values for steps/day in special populations. Prev Med. 2009;49(1):3-11. doi: http://dx.doi.org/10.1016/j.ypmed.2009.04.012. 7. Yentes JM, Sayles H, Meza J, Mannino DM, Rennard SI, Stergiou N. Walking abnormalities are associated with COPD: An investigation of the NHANES III dataset. Respir Med. 2011;105(1):80-7. doi: http://dx.doi.org/10.1016/j.rmed.2010.06.007. 8. Yentes JM, Rennard SI, Blanke D, Stergiou N. Abnormal gait mechanics in patients with COPD. Clinical Biomechanics. In Review. 9. DeVita P, Hortobagyi T. Age causes a redistribution of joint torques and powers during gait. J Appl Physiol. 2000;88(5):1804-1811. 10. Saey D, Debigare R, LeBlanc P, et al. Contractile leg fatigue after cycle exercise: A factor limiting exercise in patients with chronic obstructive pulmonary disease. Am J Respir Crit Care Med. 2003;168(4):425-430. doi: http://dx.doi.org/10.1164/rccm.200208-856OC. 11. Saey D, Côté CH, Mador MJ, et al. Assessment of muscle fatigue during exercise in chronic obstructive pulmonary disease.Muscle Nerve. 2006;34(1):62-71. doi: http://dx.doi.org/10.1002/mus.20541. 12. Nici L, Donner C, Wouters E, et al. Skeletal muscle dysfunction in chronic obstructive pulmonary disease. A statement of the American Thoracic Society and European Respiratory Society. Am J Respir Crit Care Med. 1999;159(4):S1-40. 13. Allaire J, Maltais F, Doyon J, et al. Peripheral muscle endurance and the oxidative profile of the quadriceps in patients with COPD.Thorax. 2004;59(8):673-678.doi: http://dx.doi.org/10.1136/thx.2003.020636. 15. Gosker HR, van Mameren H, van Dijk PJ, Engelen MPKJ, van der Vusse GJ, Wouters EFM, Schols AMWJ. Skeletal muscle fibre-type shiftingand metabolic profile in patients with chronic obstructive pulmonary disease. Eur Respir J. 2002;19(4):617-625. doi:http://dx.doi.org/10.1183/09031936.02.00762001. 16. Hamilton AL, Killian KJ, Summers E, Jones NL. Muscle strength, symptom intensity, and exercise capacity in patients with cardiorespiratory disorders. Am J Respir Crit Care Med. 1995;152(6):2021-2031.doi: http://dx.doi.org/10.1164/ajrccm.152.6.8520771. 17. Hamilton AL, Killian KJ, Summers E, Jones NL. Symptom intensity and subjective limitation to exercise in patients with cardiorespiratory disorders. Chest. 1996;110(5):1255-1263.doi: http://dx.doi.org/10.1378/chest.110.5.1255. 18. Mador MJ, Deniz O, Aggarwal A, Kufel TJ. Quadriceps fatigability after single muscle exercise in patients with chronic obstructive pulmonary disease. Am J Respir Crit Care Med. 2003;168(1):102-108. doi:http://dx.doi.org/10.1164/rccm.200202-080OC. 19. Maltais F, LeBlanc P, Whittom F, et al. Oxidative enzyme activities of the vastus lateralis muscle and the functional status in patients with COPD. Thorax. 2000;55(10):848-853. doi: http://dx.doi.org/10.1136/thorax.55.10.848 . 20. Wouters EFM, Creutzberg EC, Schols AMWJ. Systemic effects in COPD. Chest. 2002 05;121(5):127S-30s. 21. Gea J, Agusti A, Roca J. Pathophysiology of muscle dysfunction in COPD. J Appl Physiol. 2013 May;114(9):1222-1234. doi:http://dx.doi.org/10.1152/japplphysiol.00981.2012. 22. Kuo AD, Donelan JM, Ruina A. Energetic consequences of walking like an inverted pendulum: Step-to-step transitions. Exerc Sport Sci Rev. 2005;33(2):88-97. doi: http://dx.doi.org/10.1097/00003677-200504000-00006. 23. Umberger BR, Martin PE. Mechanical power and efficiency of level walking with different stride rates. J Exp Biol. 2007;210 (pt 18):3255-3265.doi: http://dx.doi.org/10.1242/jeb.000950. 24. Butcher SJ, Meshke JM, Sheppard MS. Reductions in functional balance, coordination, and mobility measures among patients with stable chronic obstructive pulmonary disease. J Cardiopulm Rehabil. 2004; 24(4):274-280. doi:http://dx.doi.org/10.1097/00008483-200407000-00013. 25. Smith MD, Chang AT, Seale HE, Walsh JR, Hodges PW. Balance is impaired in people with chronic obstructive pulmonary disease.Gait Posture. 2010;31(4):456-460. doi: http://dx.doi.org/10.1016/j.gaitpost.2010.01.022. 26. Hellstrom K, Vahlberg B, Urell C, Emtner M. Fear of falling, fall-related self-efficacy, anxiety and depression in individuals with chronic obstructive pulmonary disease. Clin Rehabil. 2009;23(12):1136-1144. doi: http://dx.doi.org/10.1177/0269215509342329. 27. Roig M, Eng JJ, Road JD, Reid WD. Falls in patients with chronic obstructive pulmonary disease: A call for further research.Respir Med. 2009;103(9):1257-1269.doi: http://dx.doi.org/10.1016/j.rmed.2009.03.022. 28. Mini-o A, Xu J, Kochanek KD. Deaths: Preliminary data for 2008. Natl Vital Stat Rep. 2010;59(2). 29. Nici L, Lareau S, ZuWallack R. Pulmonary rehabilitation in the treatment of chronic obstructive pulmonary disease. Am Fam Physician. 2010;82(6):655-660. 30. van Helvoort HA, de Boer RC, van de Broek L, Dekhuijzen R, Heijdra YF. Exercises commonly used in rehabilitation of patients with chronic obstructive pulmonary disease: Cardiopulmonary responses and effect over time. Arch Phys Med Rehabil. 2011;92(1):111-117. doi:http://dx.doi.org/10.1016/j.apmr.2010.08.012. 31. Seymour JM, Moore L, Jolley CJ ,et al. Outpatient pulmonary rehabilitation following acute exacerbations of COPD. Thorax. 2010;65(5):423-428. doi:http://dx.doi.org/10.1136/thx.2009.124164. 32. Dallas MI, McCusker C, Haggerty MC, Rochester CL, Zuwallack R; Northeast Pulmonary Rehabilitation Consortium. Using pedometers to monitor walking activity in outcome assessment for pulmonary rehabilitation. Chron Respir Dis. 2009;6(4):217-224. 33. Coronado M, Janssens JP, de Muralt B, Terrier P, Schutz Y, Fitting JW. Walking activity measured by accelerometry during respiratory rehabilitation. J Cardiopulm Rehabil. 2003;23(5):357-364.doi: http://dx.doi.org/10.1097/00008483-200309000-00006. 34. Steele BG, Belza B, Cain KC, et al. A randomized clinical trial of an activity and exercise adherence intervention in chronic pulmonary disease. Arch Phys Med Rehabil. 2008;89(3):404-412. doi: http://dx.doi.org/10.1016/j.apmr.2007.11.003. 35. Steele BG, Holt L, Belza B, Ferris S, Lakshminaryan S, Buchner DM. Quantitating physical activity in COPD using a triaxial accelerometer. Chest. 2000;117(5):1359-1367. doi: http://dx.doi.org/10.1378/chest.117.5.1359. 36. Mador MJ, Patel AN, Nadler J. Effects of pulmonary rehabilitation on activity levels in patients with chronic obstructive pulmonary disease. J Cardiopulm Rehabil Prev. 2011;31(1):52-59. doi: http://dx.doi.org/10.1097/HCR.0b013e3181ebf2ef. 37. de Blok BMJ, de Greef MHG, ten Hacken NHT, Sprenger SR, Postema K, Wempe JB. The effects of a lifestyle physical activity counseling program with feedback of a pedometer during pulmonary rehabilitation in patients with COPD: A pilot study. Patient Educ Couns. 2006;61(1):48-55. doi: http://dx.doi.org/10.1016/j.pec.2005.02.005. 38. Pitta F, Troosters T, Probst VS, Langer D, Decramer M, Gosselink R. Are patients with COPD more active after pulmonary rehabilitation?Chest. 2008;134(2):273-280. doi: http://dx.doi.org/10.1378/chest.07-2655. 39. Sewell L, Singh SJ, Williams JEA, Collier R, Morgan MDL. Can individualized rehabilitation improve functional independence in elderly patients with COPD? Chest. 2005;128(3):1194-1200. doi: http://dx.doi.org/10.1378/chest.128.3.1194. 40. Mercken EM, Hageman GJ, Schols AM, Akkermans MA, Bast A, Wouters EF. Rehabilitation decreases exercise-induced oxidative stress in chronic obstructive pulmonary disease. Am J Respir Crit Care Med. 2005;172(8):994-1001. doi:http://dx.doi.org/10.1164/rccm.200411-1580OC. 41. Walker PP, Burnett A, Flavahan PW, Calverley PM. Lower limb activity and its determinants in COPD. Thorax. 2008; 63(8):683-689. doi: http://dx.doi.org/10.1136/thx.2007.087130. 42. Rabe. Guidelines for chronic obstructive pulmonary disease treatment and issues of implementation. Proc Am Thorac Soc. 2006;3(7):641-644. doi: http://dx.doi.org/10.1513/pats.200604-099SS. 43. Houck JR, Duncan A, De Haven KE. Knee and hip angle and moment adaptations during cutting tasks in participants with anterior cruciate ligament deficiency classified as noncopers. J Orthop Sports Phys Ther. 2005 08;35(8):531-540. 44. Jackson KM. Fitting of mathematical functions to biomechanical data. IEEE Trans Biomed Eng. 1979; 26(2):122-124. doi:http://dx.doi.org/10.1109/TBME.1979.326551. 45. Dempster W. Space requirements of the seated operator: Geometrical, kinematic, and mechanical aspects of the body with special reference to the limbs. Dayton, Ohio: Wright Air Development Center Air Research and Development Command, U.S. Air Force. 1955. 46. American College of Sports Medicine. ACSM's Guidelines for Exercise Testing and Prescription. 8th ed. Baltimore: Lippincott Williams & Wilkins; 2009. 47. Ortega F, Toral J, Cejudo P, et al. Comparison of effects of strength and endurance training in patients with chronic obstructive pulmonary disease. Am J Respir Crit Care Med. 2002;166(5):669-674.doi: http://dx.doi.org/10.1164/rccm.2107081. 48. Bernard S, Whittom F, Leblanc P, et al. Aerobic and strength training in patients with chronic obstructive pulmonary disease. AmJ Respir Crit Care Med. 1999;159(3):896-901. doi: http://dx.doi.org/10.1164/ajrccm.159.3.9807034. 49. Monaco V, Rinaldi LA, Macrì G, Micera S. During walking elders increase efforts at proximal joints and keep low kinetics at the ankle.Clin Biomech (Bristol, Avon). 2009;24(6):493-498. doi: http://dx.doi.org/10.1016/j.clinbiomech.2009.04.004. 50. Zeni JA, Higginson JS. Knee osteoarthritis affects the distribution of joint moments during gait. Knee. 2011;18(3):156-159. 51. Karamanidis K, Arampatzis A. Evidence of mechanical load redistribution at the knee joint in the elderly when ascending stairs and ramps. Ann Biomed Eng. 2009;37(3):467-476. doi: http://dx.doi.org/10.1007/s10439-008-9624-7. 52. Gosker HR, Hesselink MK, Duimel H, Ward KA, Schols AM. Reduced mitochondrial density in the vastus lateralis muscle of patients with COPD. Eur Respir J. 2007;30(1):73-79.doi: http://dx.doi.org/10.1183/09031936.00146906. 53. Allaire J, Maltais F, LeBlanc P, et al. Lipofuscin accumulation in the vastus lateralis muscle in patients with chronic obstructive pulmonary disease. Muscle Nerve. 2002; 25(3):383-389.doi: http://dx.doi.org/10.1002/mus.10039. 54. Whittom F, Jobin J, Simard PM, et al. Histochemical and morphological characteristics of the vastus lateralis muscle in patients with chronic obstructive pulmonary disease. Med Sci Sports Exerc. 1998;30(10):1467-1474. doi:http://dx.doi.org/10.1097/00005768-199810000-00001. 55. Nordin E, Moe-Nilssen R, Ramnemark A, Lundin-Olsson L. Changes in step-width during dual-task walking predicts falls.Gait Posture. 2010; 32(1):92-97.doi: http://dx.doi.org/10.1016/j.gaitpost.2010.03.012. 56. Brach JS, Berlin JE, VanSwearingen JM, Newman AB, Studenski SA. Too much or too little step width variability is associated with a fall history in older persons who walk at or near normal gait speed. J Neuroeng Rehabil. 2005;2:21 doi: 10.1186/1743-0003-2-21.doi: http://dx.doi.org/10.1186/1743-0003-2-21. 57. Beauchet O, Allali G, Annweiler C, Bridenbaugh S, Assal F, Kressig RW, Herrmann FR. Gait variability among healthy adults: Low and high stride-to-stride variability are both a reflection of gait stability. Gerontology. 2009; 55(6):702-706. doi:http://dx.doi.org/10.1159/000235905. 58. Beauchamp MK, Hill K, Goldstein RS, Janaudis-Ferreira T, Brooks D. Impairments in balance discriminate fallers from non-fallers in COPD. Respir Med. 2009;103(12):1885-1891. doi: http://dx.doi.org/10.1016/j.rmed.2009.06.008. 59. Roig M, Eng JJ, MacIntyre DL, Road JD, FitzGerald JM, Burns J, Reid WD. Falls in people with chronic obstructive pulmonary disease: An observational cohort study. Respir Med. 2011;105(3):461-469. doi: http://dx.doi.org/10.1016/j.rmed.2010.08.015. 60. Roig M, Eng JJ, Macintyre DL, Road JD, Reid WD. Postural control is impaired in people with COPD: An observational study.Physiother Can. 2011;63(4):423-431.doi: http://dx.doi.org/10.3138/ptc.2010-32. 61. Chamberlin ME, Fulwider BD, Sanders SL, Medeiros JM. Does fear of falling influence spatial and temporal gait parameters in elderly persons beyond changes associated with normal aging? J Gerontol A Biol Sci Med Sci. 2005;60(9):1163-1167. doi:http://dx.doi.org/10.1093/gerona/60.9.1163. 62. Dunlap P, Perera S, VanSwearingen JM, Wert D, Brach JS. Transitioning to a narrow path: The impact of fear of falling in older adults.Gait Posture. 2012;35(1):92-95.doi: http://dx.doi.org/10.1016/j.gaitpost.2011.08.013. 63. Donoghue OA, Cronin H, Savva GM, O'Regan C, Kenny RA. Effects of fear of falling and activity restriction on normal and dual task walking in community dwelling older adults. Gait Posture. 2013;38(1):120-124.doi: http://dx.doi.org/10.1016/j.gaitpost.2012.10.023. 64. Janaudis-Ferreira T, Hill K, Goldstein RS, et al. Resistance arm training in patients with COPD: A randomized controlled trial.Chest. 2011;139(1):151-158.doi: http://dx.doi.org/10.1378/chest.10-1292. 65. Probst VS, Kovelis D, Hernandes NA, Camillo CA, Cavalheri V, Pitta F. Effects of Two exercise training programs on physical activity in daily life in patients with COPD. Respir Care. 2011;56(11):1799-1807.doi: http://dx.doi.org/10.4187/respcare.01110. 66. Ricci-Vitor A, Bonfim R, Fosco LC, et al. Influence of the resistance training on heart rate variability, functional capacity and muscle strength in the chronic obstructive pulmonary disease. Eur J Phys Rehabil Med. 2013;49(6):793-801. 67. Velloso M, do Nascimento NH, Gazzotti MR, Jardim JR. Evaluation of effects of shoulder girdle training on strength and performance of activities of daily living in patients with chronic obstructive pulmonary disease. Int J Chron Obstruct Pulmon Dis. 2013;8:187-192. 68. Vonbank K, Strasser B, Mondrzyk J, et al. Strength training increases maximum working capacity in patients with COPD--randomized clinical trial comparing three training modalities. Respir Med. 2012;106(4):557-563. doi:http://dx.doi.org/10.1016/j.rmed.2011.11.005. 69. Bemben MG, Murphy RE. Age related neural adaptation following short term resistance training in women. J Sports Med Phys Fitness. 2001;41(3):291-9. 70. Colliander EB, Tesch PA. Effects of eccentric and concentric muscle actions in resistance training. Acta Physiol Scand. 1990;140(1):31-39.doi: http://dx.doi.org/10.1111/j.1748-1716.1990.tb08973.x. 71. Sale DG. Neural adaptation to resistance training. Med Sci Sports Exerc. 1988;20(5):S135-145. doi:http://dx.doi.org/10.1249/00005768-198810001-00009. 72. Watz H, Waschki B, Kirsten A, et al. The metabolic syndrome in patients with chronic bronchitis and COPD: Frequency and associated consequences for systemic inflammation and physical inactivity. Chest. 2009;136(4):1039-1046. doi:http://dx.doi.org/10.1378/chest.09-0393. 73. Pitta F, Troosters T, Spruit MA, Probst VS, Decramer M, Gosselink R. Characteristics of physical activities in daily life in chronic obstructive pulmonary disease. Am J Respir Crit Care Med. 2005;171(9):972-977. doi:http://dx.doi.org/10.1164/rccm.200407-855OC. 74. Belza B, Steele BG, Hunziker J, Lakshminaryan S, Holt L, Buchner DM. Correlates of physical activity in chronic obstructive pulmonary disease. Nurs Res. 2001;50(4):195-202. doi:http://dx.doi.org/10.1097/00006199-200107000-00003. 75. Coen PM, Jubrias SA, Distefano G, et al. Skeletal muscle mitochondrial energetics are associated with maximal aerobic capacity and walking speed in older adults. J Gerontol A Biol Sci Med Sci. 2013;68(4):447-455. doi:http://dx.doi.org/10.1093/gerona/gls196. 76. Don R, Ranavolo A, Cacchio A, Serrao M, et al. Relationship between recovery of calf-muscle biomechanical properties and gait pattern following surgery for achilles tendon rupture. Clin Biomech (Bristol, Avon). 2007;22(2):211-220. doi:http://dx.doi.org/10.1016/j.clinbiomech.2006.10.001. 77. Smith LR, Chambers HG, Lieber RL. Reduced satellite cell population may lead to contractures in children with cerebral palsy.Dev Med Child Neurol. 2013;55(3):264-270.doi: http://dx.doi.org/10.1111/dmcn.12027. 78. Castaneda C, Gordon PL, Parker RC, Uhlin KL, Roubenoff R, Levey AS. Resistance training to reduce the malnutrition-inflammation complex syndrome of chronic kidney disease. Am J Kidney Dis. 2004;43(4):607-616. doi:http://dx.doi.org/10.1053/j.ajkd.2003.12.025. 79. Christensen JF, Andersen JL, Adamsen L, et al. Progressive resistance training and cancer testis (PROTRACT) - efficacy of resistance training on muscle function, morphology and inflammatory profile in testicular cancer patients undergoing chemotherapy: Design of a randomized controlled trial. BMC Cancer. 2011;11:326. doi: http://dx.doi.org/10.1186/1471-2407-11-326. 80. Trappe S, Creer A, Slivka D, Minchev K, Trappe T. Single muscle fiber function with concurrent exercise or nutrition countermeasures during 60 days of bed rest in women. J Appl Physiol. 2007;103(4):1242-1250. doi:http://dx.doi.org/10.1152/japplphysiol.00560.2007. 81. Pascual-Guardia S, Wodja E, Gorostiza A, et al. Improvement in quality of life and exercise capacity without muscular biology changes after general training in patients with severe chronic obstructive pulmonary disease [in Spanish]. Med Clin (Barc). 2013;140(5):200-206.doi: http://dx.doi.org/10.1016/j.medcli.2012.01.025. 82. Koutakis P, Pipinos II, Myers SA, Stergiou N, Lynch TG, Johanning JM. Joint torques and powers are reduced during ambulation for both limbs in patients with unilateral claudication. J Vasc Surg. 2010;51(1):80-88.doi: http://dx.doi.org/10.1016/j.jvs.2009.07.117. 83. Koutakis P, Johanning JM, Haynatzki GR, et al. Abnormal joint powers before and after the onset of claudication symptoms.J Vasc Surg. 2010;52(2):340-347.doi: http://dx.doi.org/10.1016/j.jvs.2010.03.005.